After a delayed departure, for me, due to the heater fan packing up on the new Buerstner, (get it mended at Truma in Burton when I return) we spent a couple of days at Camping St. Louis in Ardres & then travelled via Chalons en Champagne to Obernai, Camp Municipal Le Vallon de l?Ehn. Nr. Strasbourg. Excellent site, OAY, which will do ?Rallies?! There was a Dutch one of about 25 ?vans coming in as we were leaving to go all of 30 miles down the road to Turckheim & Camp Municipal Les Cigognes. The point of this was to visit a brilliant restaurant I?d visited before. Unfortunately the restaurant had closed and the chef had moved to another one doing simpler meals. However in finding an alternative we did discover Caf? Alsacienne ; a wonderful concoction of spirit of Myrtilles, coffee floated on top and cream on top of that! A sort of Alsatian Irish Coffee. Yum yum! We then bit the bullet and paid for two vignettes each to go through Switzerland, via Basle (lots of road works) & Zurich on the A3, to a TCS (& Camping Cheque) site, Camping Neue Ganda at Lanquart, N. of Chur. Very good facilities with a cheap internet connection and a nice camp warden called Fred. No marked pitches though and a very big mountain close by can block the satellites for Sat-TV!! The Tomtom location was out quite a bit so you need to follow the written directions in the ?Bible?. We toured around to Davos, Klosters & St. Moritz etc. (you can keep them, looked quite tatty without a covering of snow!) and then travelled with the ?vans over the Julier and Maloja passes to Colico at the N. end of lake Como. The weather was great that day and the scenery was fantastic. The Maloja is OK going East to West, when you go ?down? many hairpin bends, but it could be tricky going the other way with the ?van on, when having to go ?up? them! I have some friends who have a house in Colico (N. end of lake Como) and they entertained us very well even though the weather was rather mixed. We stayed at Camping el Logasc and again Tomtom?s location of the site was hopeless. The site only had 2A electric but Gordon (E.o.S) must have had a dodgy connection because he could draw more than 4A without the trip going out! The pitches were quite close together (typical Italian style) and getting my Buerstner out, if the site was nearly full, would have been a problem. Colico, and the area around, is great and my friends took us up roads and passes in their Nissan X-Trail (needed for the snow in winter!) that we?d never have discovered on our own. And I didn?t have to drive!! Their house is fairly new and has 3 levels + underground garage and utility room with its own shower!! It has numerous rooms so that they can easily accommodate their visiting sons and daughter and partners etc. Driving in Italy, you should always use dipped headlights, in daylight, on all main roads etc, but Main Beam is illegal even at night! My friend got fined for this! Also you are not supposed to wash your car other than at a car-wash centre, but being Italian many seem to ignore it! I washed the mucky Passat at the ?Camper Service? point in the campsite!! Many fuel stations are not attended and you need to use credit cards or bank notes. We found that quite a few don?t work properly and have tended to use the Q8 stations which generally have someone to serve you. Gordon & I are now camping at Arco (Camping Arco), 5km N. of Riva del Garda. Scenery is superb round here and far better than down in Pacengo (Camping Le Palme) on the E. coast of lake Garda. We didn?t like it round there at all; too many amusement parks, factory outlets and ?prozzies?. We were due to go to the opera in Verona but couldn?t stand the thought of staying in that area for any longer so gave the opera a miss and moved here instead. Riva is a very busy town (even in June) and the campsites looked pretty crowded to us, so if you are thinking of staying around here I?d certainly recommend Camping Arco. It?s not on the lake, but there is a swimming pool next to the site with a pizzeria and, tonight, a rock band!!! The pitches are pretty large although some seem strangely arranged with trees in the middle of the pitch, rather than demarcating the extremities. If you want something more sedate then there?s a super site (Camping Spiaggia-Lago di Molveno) on lake Molveno, about 27 miles north. 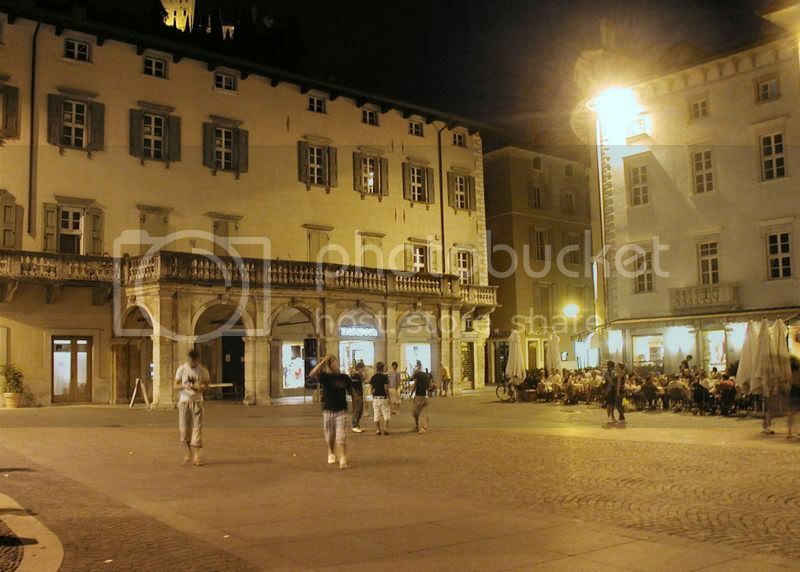 It has the feel of a Spa town and is much more relaxed than sites on lake Garda. All these sites are ANWB sites (Dutch camping organisation) and were spot on for POI location on Tomtom. Unlike many of the Italian camping POI?s! They are very well run sites although, as here, you may only get 3-4A electrical hook-ups in Italy. Sounds like you both are having a great time good luck and all the best.. It?s still hot, 33deg. & we went on another trip up to see the mountains, this time at the ski resort of Madonna di Campaglio. The towns and villages on the way looked very smart and neat and put those in Switzerland in a far less favourable light, which surprised us! In fact many of the Swiss villages & towns appeared rather scruffy to us when compared to Italian and French ones. We?re moving on next week into Austria, probably staying at Camping Eichenwald in Stams, behind the monastery & next to the ?dry? ski-jump. We will hopefully go up the Oetztal to see the reconstructed village, Oetzidorf, depicting the life style of the ?ice man? discovered at the end of the valley in 1991 and shown in the famous TV programme. Then we hope to meet up with Dave & Lisa in the Blackforest around Titisee, at the beginning of July. Then it?s pottering back to Calais and home for mid-July. Hey-ho it?ll be Brown-land rather than Blair-land; wonder if we?ll notice the difference!! Thanks for the very entertaining posts, glad your having a good time, our regards to Gordon we'll see you soon. safe trip home boys. We are off to Lake Garda in 7 weeks and can't wait, reading about this makes me more excited !! Good to hear you chaps are living THE life !! Any tips appreciated gents ! Thanks for all the good wishes. Some supermarkets here seem to open most of Sunday, others shut at 12:30. Right further to the new sandals and socks, here's the proof!! Taken in a super restaurant in Arco by a German Prof. who spoke very good English and joined us at our table. Here's the town square as we wended our way back to the car. D@mn good evening was had by all!! Then we hope to meet up with Dave & Lisa in the Blackforest around Titisee, at the beginning of July.. . . . . However in finding an alternative we did discover Caf? Alsacienne ; a wonderful concoction of spirit of Myrtilles, coffee floated on top and cream on top of that! A sort of Alsatian Irish Coffee. Yum yum!